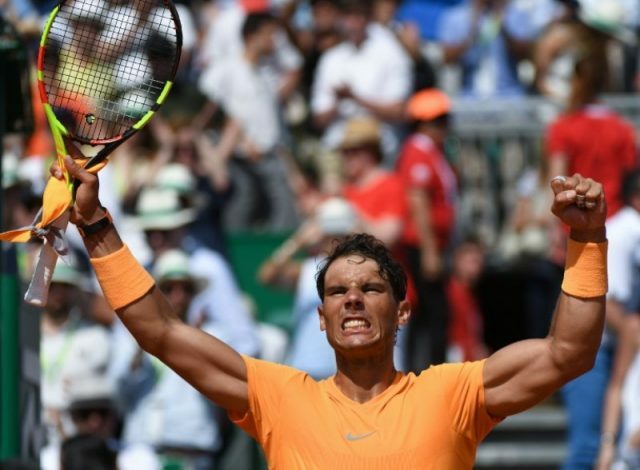 World number one Rafael Nadal swept aside Grigor Dimitrov to ease into his 12th Monte Carlo Masters final with a 6-4, 6-1 victory on Saturday. The 31-year-old, who needs to win an 11th Monaco title to retain the number one ranking ahead of Roger Federer, will face either Kei Nishikori or Alexander Zverev in Sunday’s final. “Every year is different and equally special,” said Nadal, after beating Dimitrov for the 11th time in 12 meetings. Nadal came through a tight first set but always looked too strong for Dimitrov and raced through the second in half an hour. “He’s playing very good on clay. Simple as that. Tactically and everything else,” admitted Dimitrov. The top seed is bidding for an outright record 31st Masters title this week and extended his run of consecutive sets won on clay to 34. Nadal, playing his first ATP tournament since he retired from his Australian Open quarter-final against Marin Cilic in January with a hip injury, has shown no signs of rust. Following a 6-0, 6-2 last-eight demolition of Dominic Thiem, Nadal has lost only 16 games in four matches this week. Dimitrov immediately put Nadal’s serve under pressure with two perfectly-judged lobs forcing deuce, but the top seed came through an eight-minute opener. Nadal didn’t take long to get into his stride, breaking at the first time of asking as Dimitrov struggled in the longer rallies. The Bulgarian continued to go for his shots and brought up three break-back points in game five as Nadal followed a double fault with two wayward groundstrokes. Nadal fired long, before Dimitrov saved a break point himself with a venomous forehand to level at 3-3. The 16-time Grand Slam champion wrapped up the set with a whipped forehand onto the line. “It was my fault when I got broken. Simple as that,” said world number five Dimitrov. That effectively ended Dimitrov’s chances, and Nadal broke to love in the second game of the second set.